In July 1978, I boarded a bus in Cleveland for the overnight trek to Washington, D.C., to join the herd of feminists marching to get the Equal Rights Amendment off the dime. In November 1989, I showed up there again to protest state and federal legislative attempts to undercut a woman’s right to an abortion. Did we send powerful messages? I think so. Many of you will not remember the early 1970s or Helen Reddy’s feminist anthem “I Am Woman” (“hear me roar … in numbers too big to ignore”), but it strikes me that her lyrics still ring true today. Just as throngs of protesting American women made waves in the ’70s and ’80s, now masses of women marching elsewhere on the planet are setting an example for us. Thirty-six hours, that’s how long it took the Polish Parliament to reject a proposed near total ban on abortion last week. 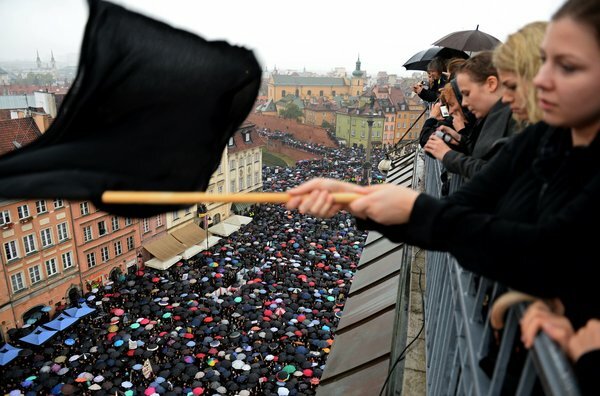 Parliament had, apparently, been “taught humility” by women across the country, who brought the eyes of the world onto the streets of Poland when tens of thousands thronged the streets in a mass strike clad all in black, for their self-styled “Black Monday” protest. The Government’s swift and grovelling change of heart, was a resounding victory for people power that will go down in the history books. Bangalore ranks first among the four major cities in south India in terms of the number of crimes against women. 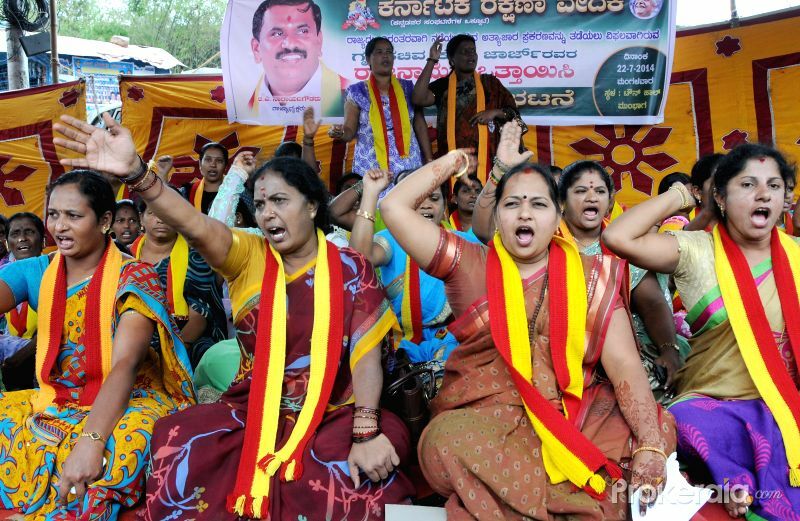 Members of Karnataka Rakshana Vedike Women wing demonstrate against Siddaramaiah-led Karnataka government for its failure to curb crime against women. Northern Ireland currently bans abortion in all cases except when the life of the mother is in danger. In response, abortion-rights campaigners took part in a demonstration through Belfast city center on April 30, 2016. 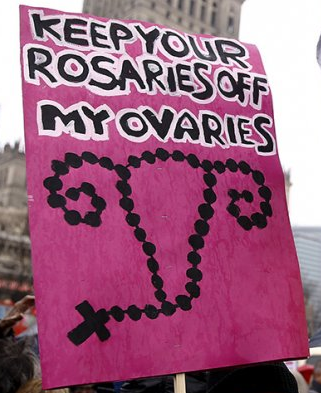 Abortion prosecutions forced the issue to the center of the campaign ahead of regional elections, with unprecedented political support for an end to the current ban. 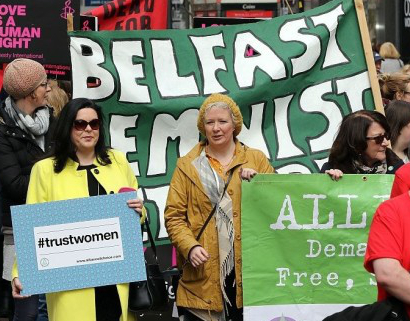 As of this month, polls show that nearly 60 percent of people in Northern Ireland believe abortion should be decriminalized. Politicians have been slow to follow, but several court cases are challenging the draconian abortion laws. Here in the United States, nobody is trying to take our driver’s licenses away (so far), but our reproductive rights are facing near-certain assaults in the coming years from all branches of federal government, and from many state governments brimming with staunch social conservatives trying to turn back the clock. So, what’s a gal or guy fighting such threats to do? Wait for someone or some group to ask him or her to show up somewhere or donate money or time? Hope for the best? Let’s drag out the clichés — hope is not a plan; be proactive; the best defense is a good offense. Keep up with the goings on in our capitals and communities. Think about what might happen and decide in advance what you will do if events begin unfolding in that direction. Watch to see if 2016 campaign rhetoric was just disingenuous pandering for votes or if it resurfaces in the reality of governing and lawmaking about women’s health. Which of the following assaults would propel you into the streets, onto the picket lines, and to engage in civil disobedience? “Constitutional amendment — life begins at conception” — Says who?! After the protests I participated in back in the 1970s and ’80s, I thought we were done. By the 1990s — foolishly, it turns out — I breathed a sigh of relief that we had finally passed the tipping point, that women were safe from the zealots, and women of my generation would never again have to show up for this stuff. Volunteer when some civil disobedience act needs a woman willing to risk arrest. Show up on the steps of a Tucson or Phoenix or Washington government building with the most eye-catching, clever sign I can produce. Even if I’m the only protester there, individual action matters. Step up my note-writing to all government representatives involved to oppose any decision to cut back on any reproductive rights. Follow up with calls to their offices. Engage more with friends and family members in support of women’s issues. Suffragists holding banners in front of the White House. One banner reads: “Mr. President How Long Must Women Wait For Liberty.” White House visible in background. 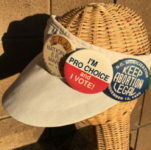 This entry was posted in Abortion, Activism, History, Legislative Watch and tagged abortion, activism, Bangalore, Belfast, birth control, Black Monday, Civil Disobedience, contraception, crowds, driving, election, Equal Rights Amendment, ERA, Helen Reddy, India, medication abortion, Northern Ireland, Planned Parenthood, Poland, pro-choice, protest, reproductive rights, Saudi Arabia, voting, women's health, worldwide demonstrations by Anne Hopkins. Bookmark the permalink. ACTION ALERT: Second Anti-Choice Bill in House Committee TOMORROW! The History of the Birth Control Pill, Part 1: Hormones, Our "Chemical Messengers"